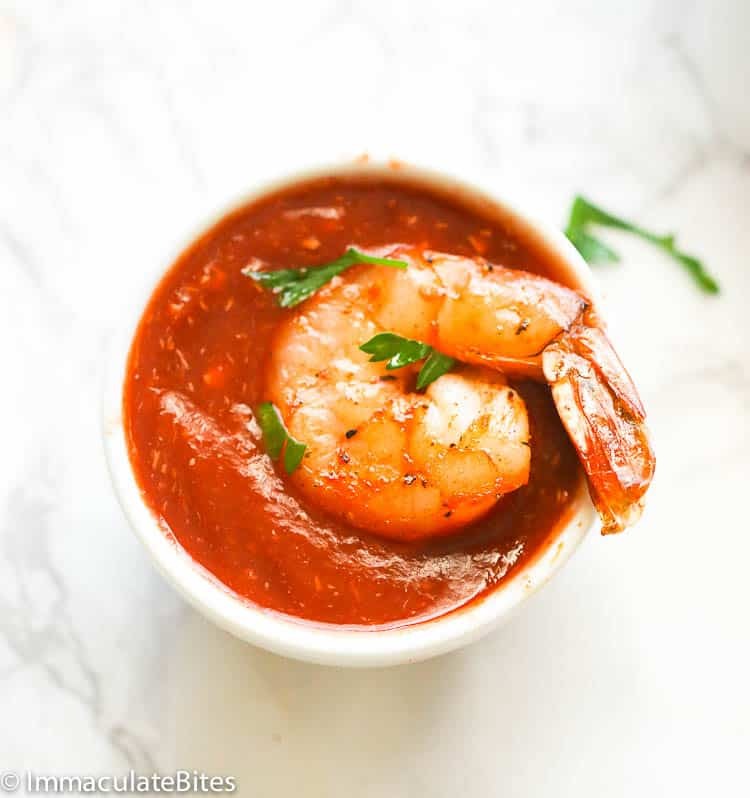 Cocktail Sauce Recipe paired with roast shrimp – tasty spicy homemade sauce made primarily with ketchup, chili sauce, Worcestershire sauce and horseradish. Comes ready in less than 5 minutes. The perfect appetizer and dipping sauce to entertain your guests! Hello, hello weekend! Oh boy, I’m totally excited for this weekend as we’re visiting a close friend of mine and we’re throwing a potluck party. And just so you know, I sometimes go the extra way when it comes to gatherings. I’m tasked with the snacks and appetizers and so I’ll be bringing these baked Buffalo Wings, this addictive fried pastry Chin Chin (which I’ve already ticked off from my list, by the way) and this shrimp Cocktail Sauce here. I’m kinda thinking already of adding some bite-sized desserts like some mini versions of this Pecan Pie ...hmmmm.. what do you think? Okay, now back to this cocktail sauce. 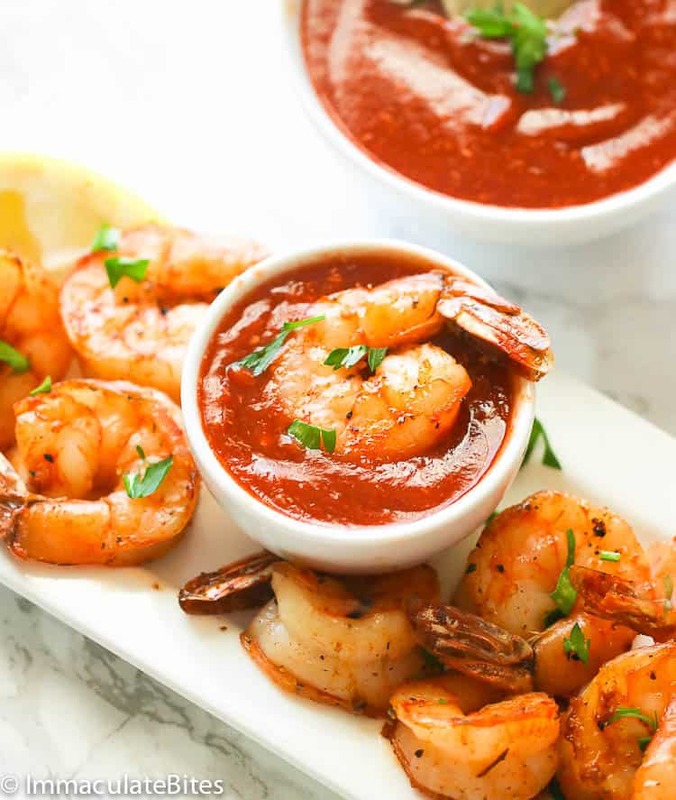 Cocktail sauce is often served with seafood as a condiment. It is often referred to as seafood cocktail or shrimp cocktail. It generally uses ketchup, chili sauce, lemon juice, Worcestershire sauce and prepared horseradish. And yes, you probably get by now that its on spicy side of sauce. 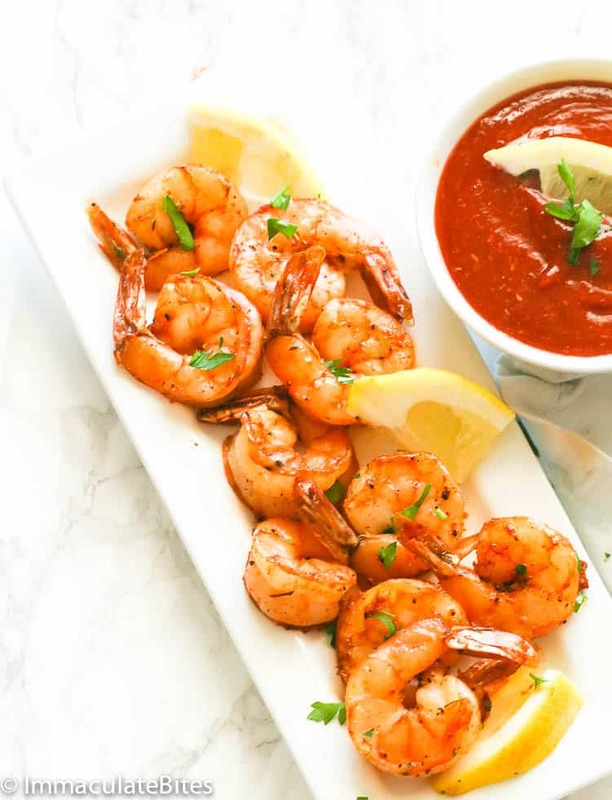 It has the right combination of flavor that makes any shrimp extra delicious. And it’s way better than the store-bough ones. The lemon juice in this recipe adds a depth of flavor and a bright fresh acidity, while the horseradish binds them all and brings out all the classic flavors of a cocktail sauce. Cocktail sauce are as easy as 1,2,3. . Only 5 minutes of your time (or even lesser) when making this. Simply combine and mix all the ingredients in a bowl. 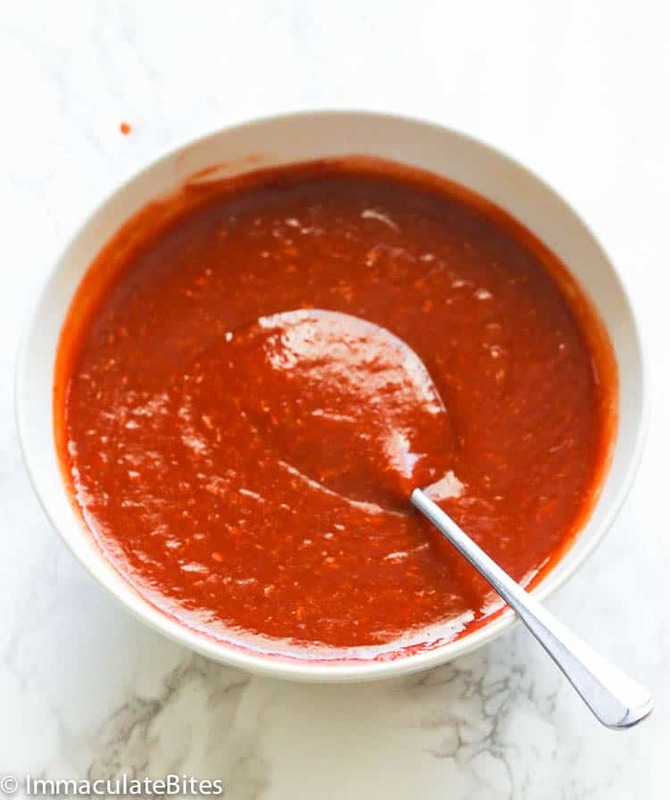 I highly suggest though that you place this in the fridge before serving to allow the flavors to settle down or else you’ll end up with sort of like a “just a spicy ketchup”. What to serve with cocktail sauce? Aside from shrimps, this cocktail are also great with shellfish, crab, oyster and even salmon. 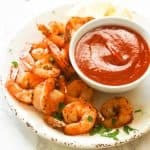 You may also thicken this sauce and turn it into a glaze by adding mayonnaise into it and ready to serve on appetizers, meatloaf, calamari or fried mushrooms. 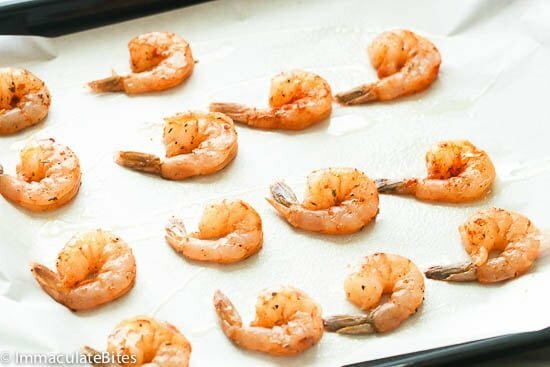 You may also pair it with this Coconut Shrimps or Marinated Grilled Shrimps here. Let me leave you with this and keep you drooling over these juicy shrimps and spicy clever sauce. I’m off now baking some sweet treats. You will never buy store-bought cocktail sauce after this. You can make this sauce several days in advance and keep it in the fridge. Store any leftover cocktail sauce in an airtight container in the fridge. It could last to up to a week. 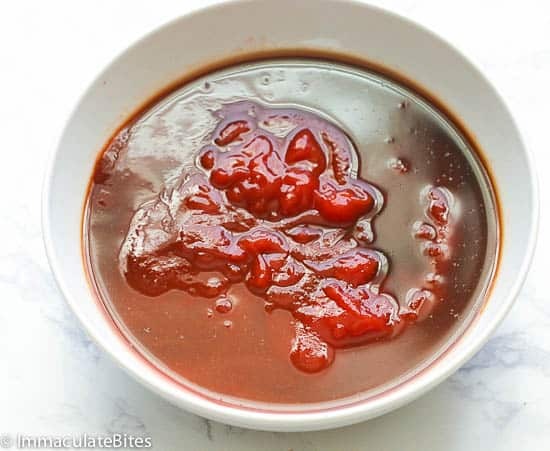 Cocktail Sauce Recipe – tasty spicy homemade sauce made primarily with ketchup, chili sauce, Worcestershire sauce and horseradish. Comes ready in less than 5 minutes. The perfect dipping sauce to entertain your guests! Combine and mix all ingredients either by hand or a blender. For a milder sauce use less horse radish. Let it sit in the fridge first for 60 minutes before serving. 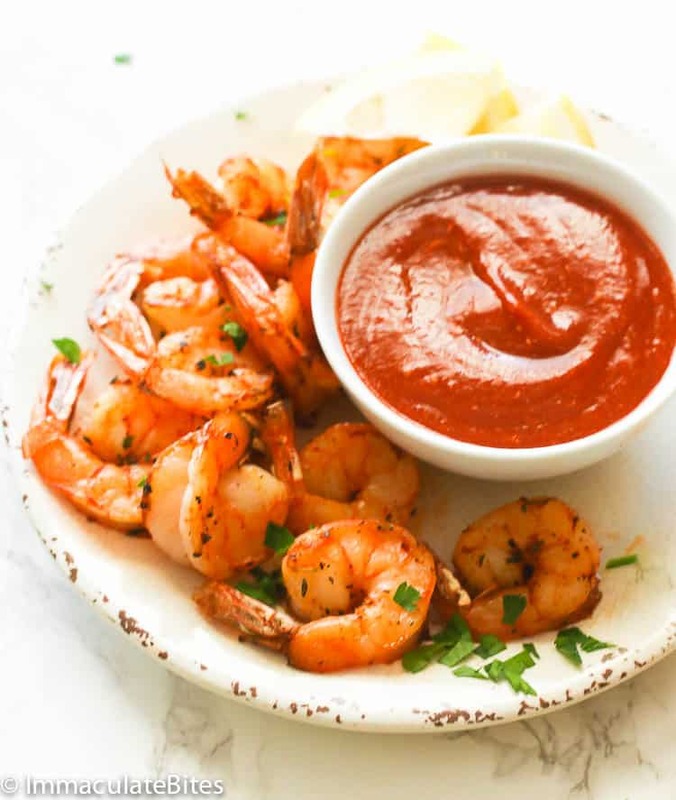 In a medium bowl mix shrimp with creole seasoning salt, pepper and oil place in a single layer. Yummy. I made it extra hot by adding extra chili sauce. Really delicious. Thank you Imma. Way to go, Sally! Love me some extra hot sauce. 😉 Thanks for trying it out. Dear Imma, I love your recipes. I invite my grandchildren to experience fine dining. Thank you! Thanks for inviting them along. So sweet of you to let me know. Have a Great Weekend! What is the correct pleural of shrimp? 1. For the sauce, combine the ketchup, lemon juice, horseradish, Worcestershire sauce, and Tabasco® Sauce. That would be shrimps. Thank you for sharing your recipe, Frank.